USA, TWENTY DOLLARS OR DOUBLE EAGLE, 1864S, Liberty head. Nearly uncirculated and rare in this condition. Ex SS Republic shipwreck, 1865, in a slab by NGC as MS62, in a display case by Odyssey Marine Exploration. USA, FIVE DOLLARS OR HALF EAGLE, 1897, Liberty head. Underlying brilliance, good extremely fine. 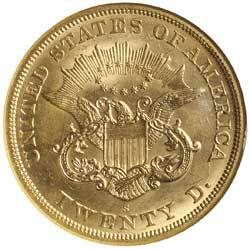 USA, TWENTY DOLLARS OR DOUBLE EAGLE, 1891S, Liberty head. Good extremely fine. 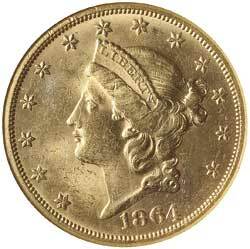 USA, TWENTY DOLLAR OR DOUBLE EAGLE, 1895, Liberty head. Nearly uncirculated.